Picana - Recipe for Bolivian Christmas Picana - Bolivian Christmas Traditions! 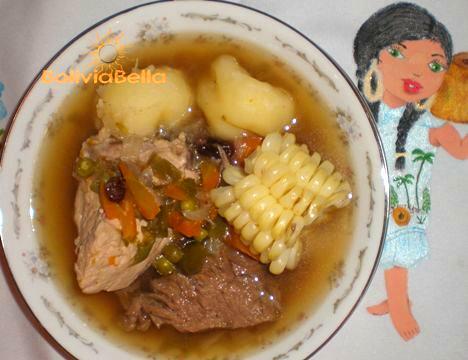 ESPANOL Picana is a soup made with various types of meat, potatoes and vegetables, along with both wine and beer. Traditionally, picana is eaten at midnight on Christmas Eve. Learn more about Christmas in Bolivia here. Tell us about your Christmas traditions! 1. In a pressure cooker with one and a half quarts of boiling water cook the beef for one hour. Once the beef is bland, add pieces of the lamb and chicken, having first washed and cleaned them. Fry the green chili peppers until they are slightly black. Remove the stems and seeds and blend. Add to the soup. Slice (julienne style) and add the carrots, turnips, pumpkin, onions, celery, red pepper and salt to taste. When the meats are nearly fully cooked, add the whole (peeled) potatoes and boil until tender. 2. Meanwhile, in a second pot with plenty of water cook the corn and anise and add the sugar. 3. Once the potatoes and meat are fully cooked add the wine, beer, bay leaves and oregano and allow to boil. 4. Serve in a bowl, with one piece of each type of meat, potatoes, vegetables and corn. Every Bolivian family has a recipe for picana and every one of them believes their's is the best. You can make slight changes to this recipe to suit your taste buds as well, but in order for it truly be picana, it has to have at least two kinds of meat, and both wine and beer. Enjoy!